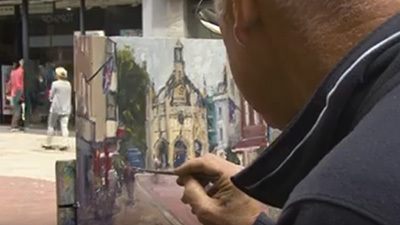 Painting in oils, Fred's wonderfully subtle use of colour and tone is portrayed to the full. 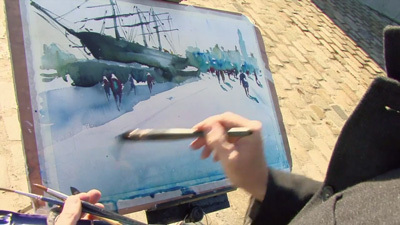 He sketches and paints in Rye Harbour and on Camber Sands, two of his favourite haunts along the south coast of England. Then, working from this material, he produces several paintings in his studio, portraying the landscape in a wide range of moods and atmosphere. Fred Cuming has gained a significant international following over the last 30 years. He is a fascinating painter to watch - a left handed artist, who often radically reworks his canvases with great confidence. 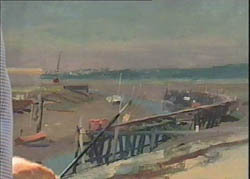 The Art of Fred Cuming RA from APV Films starts with the artist making an oil sketch of Rye harbour. 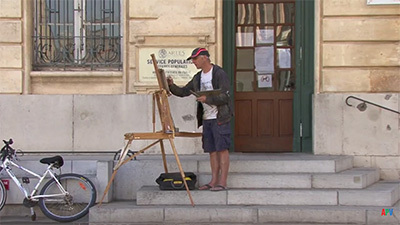 His immediate aim is to produce a colour study that can be used for reference in the studio. He believes it is the prevailing atmosphere that initially attracts him to a particular scene and the capturing of the atmosphere remains his major preoccupation in much of his current work. When he begins painting he assesses the tonal relationships between colours, broadly blocking in shapes as he analyses the composition. He discusses how he develops the tonal progression to give a sense of recession, and how to use elements of contrasting colour to lift the overall scheme. Back in the studio he adapts the information from the sketch to produce a stronger composition. 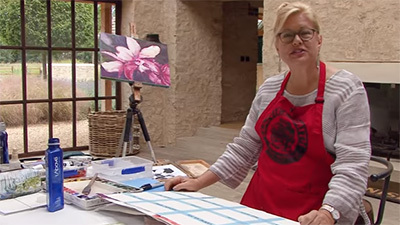 Suddenly, just when the painting is coming together, Cuming shocks the viewer by rubbing off most of the colour until only a ghostly image remains. 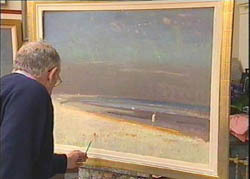 Less experienced artists may not have the courage to do this, but as we see later, he successfully reworks the composition. The second demonstration takes place at Camber Sands. Anyone who has been there will have experienced the sensation of being in a vast, expansive space. On two visits he explores its changing moods, the contrast of the vivid dunes against the sand, and the variety of cloud formations. In his studio he develops a much bigger painting including a number of figures and a sky marked by vapour trails. 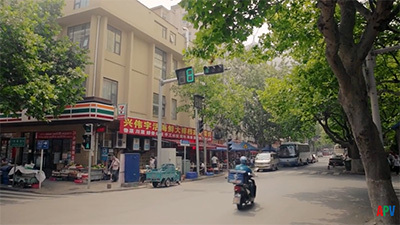 However, when it looks complete, he explains why he is dissatisfied with the composition and suggests reworking it after a period of reflection. It is a surprise when we see his finished painting, almost devoid of its figures and with the emphasis more firmly on the sky and the feeling of space. It returns to what had been his original intention - atmosphere, as ever, being his main concern. 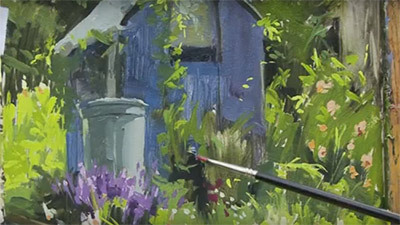 This is an interesting video that should encourage painters never to be satisfied with a painting that is 'nearly there'. Cuming's shows the potential of determination and passion. Painted in oils, Fred Cuming's pictures are all about the sensitive use of colour and tone to capture a feeling of space, light and, above all, mood. 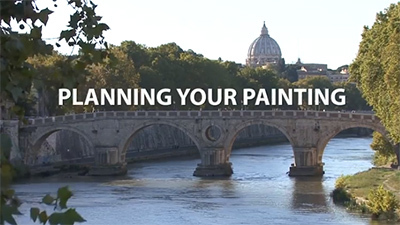 This film is a wonderful insight into his working methods and the sort of thought processes and constant deliberations and considerations that take place as he paints. At Camber Sands and Rye Harbour, two of his favourite locations, Fred tackles the kind of subjects that interest him most - those with "atmosphere and horizons: pictures with very little in them." He makes colour notes, sketches and paintings on the spot and then, working from this material, produces several paintings in his studio. The commentary throughout the film is rich in astute observations and advice, not the least being that we "shouldn't be intimidated by the subject, but rather think a painting as a painting." 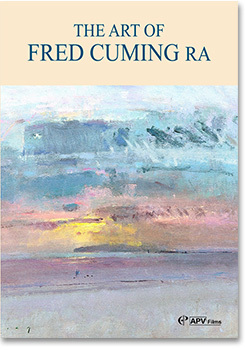 Fred Cuming is well known for his sensitive use of colour to interpret the feeling of space, light and, above all, mood in a scene, and in The Art of Fred Cuming we are given a wonderful insight into his distinctive working methods. The film is full of astute observation and advice, and it is enthralling to watch Fred as he paints at two of his favourite locations, Camber Sands and Rye Harbour. The subjects that interest him most are those "with very little in them: atmosphere and horizons". He makes superb colour notes, sketches and small paintings on site, later using this information for several studio paintings.